One of the most famous and most beautiful lieder cycles is sung complete in the original German version. A selection from cycles composed by Antonín Dvořák (Cypresses, Evening Songs op. 3, 31) and Bedřich Smetana (Evening Songs), the second half of the concert featuring songs by Robert Schumann, Felix Mendelssohn-Bartholdy, Franz Liszt, Johannes Brahms, Gustav Mahler. This programme presents romantic songs by Antonín Dvořák (Zigeunermelodien, Love Songs), ingenious arrangements of folk tunes made by Leoš Janáček (Moravian and Hukvaldy Folk Poetry in Songs), symbolism in the work of Vítězslav Novák (Valley of the New Kingdom, Erotikon, Melancholie), poetry of Jaroslav Seifert in the songs of Jaroslav Křička (Eglantine), the unique treatment of the folk song by Bohuslav Martinů (New Slovak Songs, Songs on One Page, Songs on Two Pages, New Chap-Book) and to conclude, a selection from the oeuvre of the most outstanding Czech composer of the second half of the 20th century, Petr Eben (The Most Secret Songs, Six Love Songs, R. M. Rilke Songs, Nursery Songs). Joint performances with Petra Matějová, a renowned pianoforte player (the copy of an Anton Walter & Sohn pianoforte of 1805 was made by Paul McNulty from Divišov). The major programme is called The Poet and the Night: Wandering Towards Love from Dusk to Dawn. The compositions have been chosen from among more than six hundred songs written by Schubert and subsequently ordered to create a self-contained story taking place during one spring night. The listeners will find out that a lot of the scarcely played Schubert’s songs are of no lesser quality than the most popular pieces by the composer. The program can be enriched by a reciter appearing in the role of the Poet. In 2011, listeners had an opportunity to hear the world premiere of several parts of the first, not-so-famous song cycle by Antonín Dvořák Cypresses. 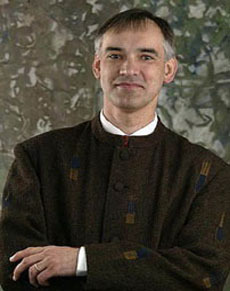 The pieces were arranged by Stanislav Předota and performed together with the Vlach Quartet. (This cycle is also offered in the original form for voice and piano.) This venture has evolved into collaboration between the singer and the quartet, which aims to focus on music literature for voice and strings (sometimes with piano accompaniment – Helena Suchárová-Weiser). The affirmative review for the CD "Caesar vive!" from the U.S.A.
"We have had several recent discs focused on kings and emperors, but this is the first one I recall for the Emperor Rudolf II, the last emperor who dwelt in Prague (the line began with Charles IV). The main work is a Mass of Carl Luython (1557–1620), published in 1609 in a collection of his masses dedicated to the emperor… The rest of the program is an odd amalgam of materials focusing on Rudolf’s favorite castle outside Prague… The selection is speculative, of course, but Martin Horyna, the conductor of the ensemble, has pursued the sources closely. The unaccompanied mixed voices blend well and offer a lovely sound. We should hear more from this fine group." Sound samples from the CD can be found on this very site (Fraternitas Litteratorum / Recordings). The CD can be ordered in the internet shop Siroky dvur (www.cdmusic.cz). "…The attractive programme is skilfully interpreted by the Czech ensemble Fraternitas Litteratorum led by Stanislav Predota. With a slim sound and well-balanced registers the eight singers bring to our ears carefully articulated music, segmenting the horizontal structure in a very determinate and appealing manner. Their strength lies in their mastery of the vocal polyphonic line of the mass as well as the motet settings… What is worth our attention is not only the enrichment of the repertoire, but also the ensemble established apart from major Western musical centres, whose further career should be carefully followed." Anthologies dedicated to the immensely rich musical life of Prague imperial court are always somewhat problematic in terms of selection. The Fraternitas Litteratorum ensemble have handled this challenge successfully, avoiding the danger of making the selection too fragmented. In the core of the anthology lies a complete mass of the Flemish composer Carl Luython, who was employed at the court of Rudolph II and of whose works there are hardly any recordings. The chamber size of the ensemble, the delicate preludes of the small organ between the parts of the mass and the acoustic timbre come together to evoke the intimate environment of the castle chapel, which was in accord with Rudolph´s dislike of spectacular and noisy productions. This spiritual music is accompanied by mysterious compositions evoking special atmosphere mingling mysticism and alchemy, for which the monarch held such passion. These include three-voice works with difficult hermetic texts published in 1618 by the Emperor´s personal physician, as well as techniques developed by the Friulian composer Alessandro Orologio and the Franc-Flemish composer Jacob Regnart in their secular three-voice compositions written to Italian and German texts. With utmost sincerity, the interpretation endows the works with the original spirit of their time.